Published April 9, 2018 at 5:13 p.m. The Packers were first organized at a meeting in downtown Green Bay 10 decades ago. Since that August day in 1919, the team's enduring football success – in the smallest market in all of North American professional sports and as the only publicly owned franchise in the NFL – has become one of the greatest stories in sports history. Over the course of 100 years and 1,392 league games, the Packers have given fans plenty to celebrate, with 13 world championships, 25 Pro Football Hall of Famers and a one-of-a-kind home, beloved Lambeau Field. As the team prepares for its centennial season in 2018, the Packers are inviting fans to join the team in recognizing their historic milestone with "100 Seasons." On Monday, Packers President/CEO Mark Murphy announced some of the plans and details for the commemoration in Green Bay, saying "You only turn 100 once." According to the team, 100 Seasons is "the epic, 16-month celebration of the Packers' rich history, which will be capped by the franchise's 100th birthday on Aug. 11, 2019." Over the next several months, the Packers will kick off a wide variety of events and activities, with fans and community members invited to join in the numerous festivities. Beginning in June, Lambeau Field Live, a traveling interactive exhibit presented by Associated Bank, will take the Packers on the road, bringing everything fans love about Lambeau to five locations around the state: Summerfest, the Northern Wisconsin State Fair, EAA AirVenture, the Wisconsin State Fair and Taste of Madison. Fans visiting Lambeau Field Live can enjoy Play 60 activities, alumni meet-and-greets, a satellite team Pro Shop and Packers Hall of Fame, a Lambeau Leap wall and a unique virtual-reality display presented by Patrick Cudahy. Lambeau Field Live visitors also will have the chance to win prizes, including tickets and autographed merchandise, by registering for Packers Pass at packers.com/passregister or through the Packers App. Later in the summer, coinciding with the beginning of training camp, fans are invited to Lambeau Field for the Packers Experience, presented by American Family Insurance, Old El Paso and Mills Fleet Farm. The four-day free festival for fans of all ages will feature activities like live music, a replica team locker room, USA Football kids' clinics, Packers alumni question-and-answer sessions, photo stations and prizes through Packers Pass. The Packers Experience begins Thursday, July 26 from 9 a.m. to 6 p.m., and continues Friday, July 27 from 9 a.m. to 8 p.m. and Saturday, July 28 from 9 a.m. to 8 p.m., concluding Sunday, July 29 from 9 a.m. to 6 p.m. The Packers Experience will also feature a theater playing a 12-minute excerpt from "Legacy: 100 Seasons of the Green Bay Packers," presented by American Family Insurance. "Legacy" is a 10-part documentary series, featuring one- or two-hour films each dedicated to a decade of Packers history. The films will include never-before-seen footage and brand-new interviews with current and former players, telling the story of the Packers from the very beginning. Additional portions of the documentary will be available on Packers.com and featured on gamedays this fall. "Legacy" will be completed in August of 2019, with the entire series available to view later in the fall of 2019. In September, to start the 2018 season, the Packers are inviting fans to Celebration Weekend, presented by Culver's and BluJay Solutions, in conjunction with their first home game. Celebration Weekend will mark 100 Seasons with a free concert, visiting alumni from several eras and the annual Green & Gold Gala, culminating with the home opener. In addition, the "100 Seasons" book will be published in 2019. Serving as a definitive history of the Packers, it will tell the story of the franchise from its birth in 1919 through the 2018 season and include historic photographs. 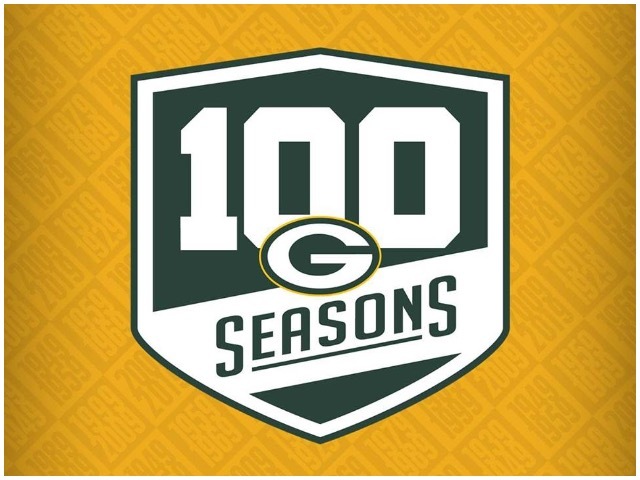 "100 Seasons" will conclude with the Packers' 100th birthday on Aug. 11, 2019. Fans can also experience 100 Seasons through a special website launching in June that will celebrate moments from the last century and through a special hashtag, #Packers100. Throughout the next 16 months, 100 Seasons flags, banners, billboards and dedicated gameday elements also will recognize the milestone. Additionally, fans will also have the chance to win special giveaways and purchase dedicated 100 Seasons merchandise from the Packers Pro Shop. Now officially underway, more information about 100 Seasons, including details about the special events, is available here.